A family owned horseback riding business located in the beautiful Columbia River Valley of British Columbia, Canada. 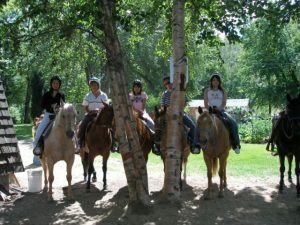 Horse camp dates are filling fast! Please email us at bookings@hardingheightsranch.com or call us at 250-364-0333 to book your child in a summer camp. ✅ Appropriate clothing including long pants for riding, closed toed shoes and a helmet (a change clothes can be packed also helmets can be provided). ✅ A waiver signed by a parent (can be done at drop off). ✅ A list of allergies and or medical issues that we should know about. $100 or $90 if paid on or before June 30th. 6th Annual EASTER EGG HUNT Come one, come all! This event is not to be missed! 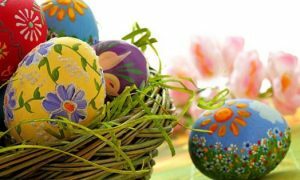 There will be LOTS of Easter candy, baby animals, hot lunch, crafts and more! Don’t forget those Easter baskets! Harding Heights Ranch is a small family owned horseback riding business located in the beautiful Columbia River Valley region of British Columbia, Canada. We take pride in our animals and in our home. Harding Heights Ranch Ltd. is probably the only Ranch that you will ever visit that does not use bits in the horses mouths or shoes on their hooves; instead we use a more natural way and we ride our horse in rope halters. Harding Heights also does not believe in shoeing our horses – all 16 of our horses go barefoot! You too can come and enjoy this “newer” way of interacting with horses and see how truly happy our horses really are!! Please come and visit us and book your Trail adventure today! Harding Heights Ranch Ltd. is probably the only Ranch that you will ever visit that does not use bits in the horses mouths or shoes on their hooves; instead we use a more natural way and we ride our horse in rope halters. Harding Heights also does not believe in shoeing our horses – all 15 of our horses go barefoot! You too can come and enjoy this “newer” way of interacting with horses and see how truly happy our horses really are!! Well kept, well cared for horses. Owning a horse is a great responsibility. Horses are by nature, companionable animals designed to graze in wide open spaces, and to be well cared for. At Harding Heights Ranch, we take pride in providing the best of care for our horses. 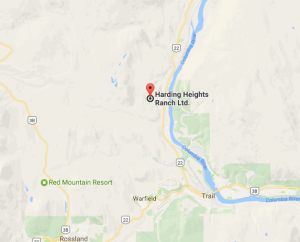 Harding Heights Ranch is located 5 minutes from Trail towards Castlegar in lovely Oasis. Harding Heights Ranch is located just outside Trail, BC, Canada, in the hamlet of Oasis. Oasis is about 4 kms from downtown Trail, on highway 3B 22 North heading to Castlegar, BC. Turn off to the left, into Oasis on Hanna Drive, and turn left at Hillcrest Drive once in Oasis, and head up all the way to the very top of the road, staying right at the Y, to Harding Heights Ranch.